First thought up by Danish fisherman Thomas Dam way back in 1959, the shock-haired Troll doll has become a staple of pop culture in every decade since. And now the little multicolored fellas are making their triumphant return via comic publisher Dark Horse. 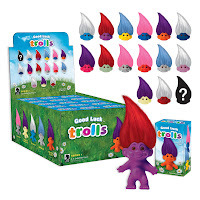 Dark Horse sees Good Luck Trolls as a natural for the company’s designer vinyl line of toys, and has created variations of color and design to pique the interest of customers. The first collection offers up fifteen different versions of the figures in various colors and with unique surface treatments, including metallic, flocked, black-light sensitive, glitter, and glow-in-the-dark. Mystery box (also known as “blind box”) trading figures are essentially the same product, varying in decoration and materials, and sold randomly out of sealed packages. Some of the figures are common to every counter display, whereas “chase” figures are much harder to come by. The ratio of availability is printed on each package, so the consumer knows the relative scarcity of the figure purchased. Dark Horse has varied the hair color within the most common figures, so that there will be more variety and more fun for the collector. For example, half of the yellow-body figures in a 2/15 ratio will have blue hair; the others will have pink hair. 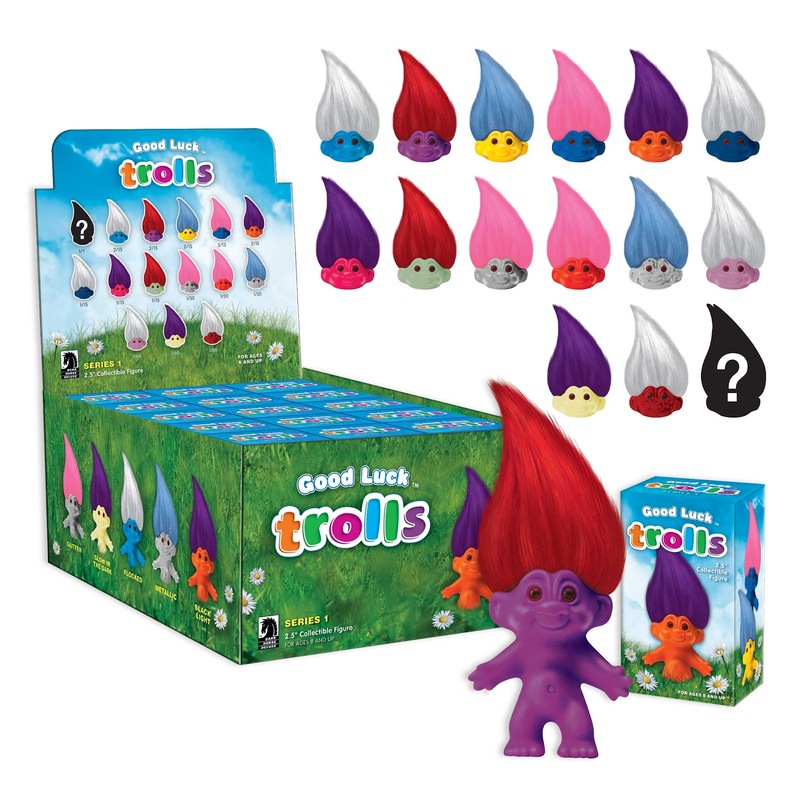 Look for the Good Luck Trolls will be hitting stores starting on July 25th, but if you're going to be in attendance at the San Diego Comic Con, you dear reader have a unique opportunity. Dark Horse will be selling a very special Troll at the Con. This limited edition Troll numbers only 1500 pieces and will only be sold at the Dark Horse booth at the show (July 12the through the 15th). As you can see, he's green. As you can't see, his white hair is black light reactive. And that, my friends, is awesome.